Unsurprisingly, the south of England is a very popular holiday destination, especially for Londoners, who are relatively near by. You can usually drive down to the coast in a few hours as long as it’s not a holiday weekend. Expect the motorways that head south to be full at the beginning and end of any public holiday, and during the school breaks the beaches get very busy too, even in inclement weather! By the way the sea is never warm, we’re talking about the English Channel, in fact most of the time it’s pretty freezing. This does not deter visitors. People wear wet suits and have learned to totally ignore the inclement weather. Listen to this wonderful traditional Cornish singing from the Sea Shanty Group Bone Idol (Scilly Boys) it’s so evocative. These are not clichés, it does rain rather a lot in England, but I’m not trying to put you off, because you’ll be missing out on especially beautiful places. My point is that even in bad weather beautiful Devon and Cornwall get pretty busy, so it’s wise to book your B&B or hotel with a sea view in advance. We were probably very unlucky, but once we camped on Dartmoor and it rained so badly that we had to abandon the whole trip. The rain and wind just wouldn’t stop and camping became impossible. I remember a small playground was completely submerged in water, the seats of the swings were no longer visible and the merry go round had drowned! We had no view at all and the beaches were being knocked by enormous waves.It was cold for July! So we had no choice but to cut our holiday short and head off home. But even though the weather forecast was for more rain and wind, the motorway was blocked with traffic heading south! Don’t forget to book. The south of England is very beautiful. It is made up of nine counties, each with beautiful coast lines and charming villages. If you are in London and fancy a trip to the seaside, then go for it. A train from Victoria Station will get you there in just over an hour. It’s perfectly possible to go for a day trip: Cheap Train Tickets: Buy Now! Here’s a link to great ticket offers for a ride on Brighton’s Big Wheel, which I highly recommend! 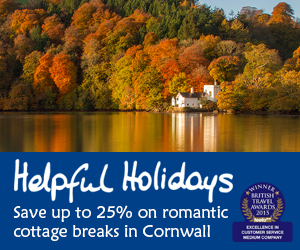 If you’re looking for myths, legends and sheer romance, then head for Cornwall, legend tells us that that’s where King Arthur was born, and a visit to Tintagel Castle, surely proves this to be so – where else could this great romantic figure come from! There are amazing coastal walks in Cornwall, that go on for hundreds of miles. Lands End is in Cornwall, and this is where you start the infamous walk to John O Groats at the very northern point of Scotland. It is a distance of 968.618 km as the crow flies and takes 10 to 14 days to walk. The South East is very interesting too, but not as wild. Here’s a wikitravel link with information about Kent, West and East Sussex and wonderful places like the Isle of Wight. I have traveled the length, breadth and height of the British Isle and love it deeply. Here’s an article I wrote about tips on making your UK holiday great! Thanks for your visit. Please tell your friends about us.